Everyone should have a behaviour tool kit and keep it well stocked and refreshed at all times! One child struggled with reading and didn’t enjoy being asked to read. He would insert words like ‘stupid’ into the text as he grudgingly read to me. He may have wanted a reaction so he didn’t have to continue. However, I completely ignored this and carried on as if it hadn’t happened and offered praise when appropriate. In the end his comments diminished and his reading improved. Sometimes we have to pick our fights! I worked in a school several years ago and was assaulted by one of the children. I didn’t handle it very well as I had not been trained how to do so. I’ve not been assaulted since, but now I would report it accordingly, unlike last time. I was involved with a pupil who was bullying others. I documented my observations and communicated with his parents. Bullying is rife in our school, but nothing seems to be done about it. The pupil’s parents were very cooperative and things improved to a certain extent. We got him to write an essay on how it feels to be bullied. I worked with a student who had anger management problems. When I could see he was getting stressed I used to take him outside, sit on the wall with him and give him a bottle of bubbles to blow so that we could talk and chill. I’m hoping to become a TA very soon and would love to be in with a chance of winning this book! Thanks to those who have shared their stories! A child I very often see at playtime gets very angry whilst playing with friends which often results in fighting. When I see him starting to get angry I go and calmly talk to him about deep breathing and clenching and relaxing his hands. It has been working to help him calm himself. I would love to know how to deal with the same difficult child. I know its not the work that he finds an issue but something causes him to misbehave constantly. What do I do when he refuses to listen to me?? I work 1:1 with a child that has Asperger’s. Their behaviour can sometimes be very difficult to manage and without experience, difficult to understand. I have had many times of book throwing, hitting and a nice right hook to the nose! BUT as long as I didn’t take it personally and understood he was frustrated but chatted after he calmed down about how he’d hurt me but I knew it wasn’t on purpose, they were able to move on from it! I find I’m always learning and changing my tactics with them so this book would be good for ideas! Within our setting we have some children with anger issues. We have established a ‘tent’ area in a central area, where the children can go to when they are experiencing difficulties. They can go into the ‘tent’ for a short amount of time (as deemed appropriate by the support staff) to calm down. Prior to this we would have children running off and hiding in the toilets/cloakroom. They now know they have somewhere safe and secure to go. A child that I worked with would hit out at other children if he felt threatened or that his friends were being threatened, we made a contract with him that he should come and find either of the 2 TA’s that worked with him, should he start feeling this way, at first he refused to comply with this, but one day I was on duty in the playground and he ran over saying he was scared of how he was feeling, we walked away from the situation and talked about his feelings. He then came with me to where the issue had started and helped me to sort the problem with the other child calmly. I have been working with a 6 yr old boy with lots of low level disruptive behaviour. I decided to ignore negative behaviour and really focused on positive behaviour. I made phone calls home when he really tried hard. Each day before class starts I spend 2 minutes with the child talking about good choices he made the day before and reminding him of school rules. It has made a huge difference to his behaviour and the quality of his work! The high point today was getting a letter from mum telling me that his behaviour at home is excellent and how pleased they were with him. Thats a win wi situation! I used to have this child in an phonics intervention class that was classed as ‘difficult’ throughout her time at primary- she’d been known to throw objects, scream, shout, swear, hit and leave without permission. Of course she displayed these traits when we first begun the group intervention yet everyday I made a point to greet her warmly, smiled, say that I enjoyed seeing her and enjoyed her in my class. At first she didn’t stay long (her choice) but I kept it up. She wasn’t given anything different than the others and my expectations were clear and the same for all present… After a while she stayed more and more and her behaviour lessened. One day she made it to the end and stayed because she wanted to chat- turns out she was being abused by a family member and wanted to tell someone she felt she could trust. I was shaking as she told me and in tears but so proud she did it. I don’t see her anymore but things changed for her. She taught me that under all that ‘bad behaviour’ is a vulnerable young person- I now tell all other TAs that it’s not the child you will dislike, just their choice of behaviour and there’s always reasons for it. There is always a reason behind behaviour, it is getting to the root of the problem and finding triggers that is the key. Getting to know the child in question, showing you are approachable at all times is paramount to the childs trust. Most behaviour is dhown as a cry for attention be it good or bad, modelling behaviour required and praising the good behaviour shown ‘catch them being good’ is important as it shows you are watching them and taking an interest in them. 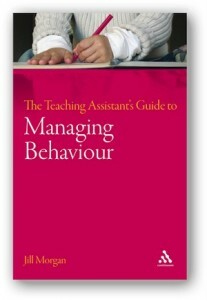 Sometimes taking a look at your delivery and work set for the child is also a factor as behaviour could be displayed because work is too difficult or too easy and the way you are teaching may need to be adapted to the ability of the child to keep them on task and engaged to reach success criteria. Thank you all so much for contributing. These are fantastic examples. We’ll be choosing the winners in the next few days.